Quite helpful I must say. I thought I was the only one who felt this way!! Now and then you might preach a sermon and finish on a personal emotional high that lasts for days. Typically you won’t. William Willimon wrote that, “On any Sunday you can give it your all and still know that the Word deserves more.” Typically you may find yourself feeling vulnerable, weak, drained, self-critical and/or regretful. 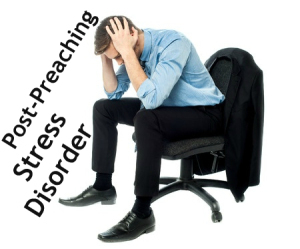 Post-preaching stress disorder: known by most preachers, not understood by most others. I like the corporate/team advice – like the whole Christian life, it’s not meant to be a solo thing.